Holbein's Dance of Death consists of a series of woodcuts, generally regarded as the best but by no means the first or the only representation of this subject. The series begins with the creation of the world and of Adam and Eve, the first humans which according to the Bible were originally immortal, but which were condemned to live and die as mortals once they were expelled from the Garden of Eden as a consequence of their disobedience to God. 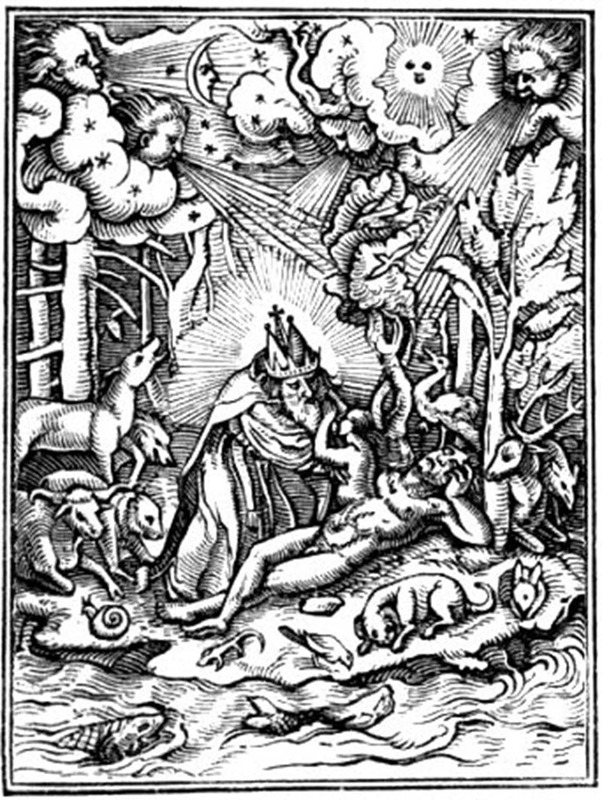 This first woodcut is must be interpreted in injunction with the very last woodcut, in which humanity is resurrected for the Final Judgment and thereafter shall never know death again. In this woodcut by Holbein, God is shown creating the universe including Adam and Eve. It is the idyllic era of the world, when death has no dominion over Humankind. That will soon change, with the Temptation of Eve, the Fall, and the expulsion of the first humans from the paradise on earth which was the Garden of Eden. In case you are wandering why some areas of the illustration have been blanked out, this is because Google's adsense policies require me to block out the naughty bits. A Biblical verse in Latin below this woodcut alludes to the Biblical story that God formed man from mud. 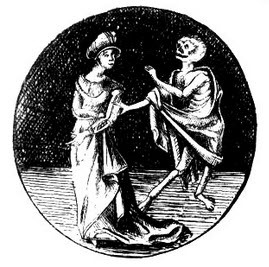 The Dance of Death is an important allegory commenting on human mortality and the passing transience of life. It depicts Death as a fairly jovial skeleton armed with a scythe, who invites his victims to a dance which invariably ends in their demise. The point of the allegory is that no one can refuse its invitation to the dance: hgh church officials, kings or paupers, all must dance and eventually die.